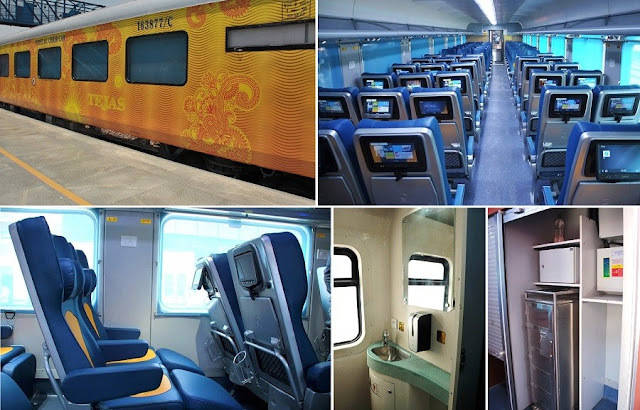 Railway passengers have reason to cheer – in the coming months, Indian Railways will roll out the new swanky Tejas Express for the Delhi-Chandigarh and Delhi-Lucknow routes as well. Two rakes of the Tejas Express are currently being manufactured in rail coach factories and are expected to be ready by September and November. “One Tejas Express rake will roll out by September this year and another one will be ready by November,” Railway Ministry spokesperson Anil Saxena told FE Online. However, Railways is yet to decide which rake would be used on which route. “We are yet to take a call on which route will get the Tejas Express from September and which from November. But, by November the plan is to roll the new luxury train out on both Delhi-Chandigarh and Delhi-Lucknow routes,” Saxena added. Tejas Express – defined as the future of train travel in India – rolled out in May this year on the Mumbai-Goa route. The luxurious train boasts of many firsts for Indian Railways. For one, this is the first train to have aircraft-like features – attendant call buttons, personalised reading lights, bio-vaccum toilets, personalised 9-inch LED infotainment screens and cushioned leg rests to name a few. The reclining seats in the train have improved upholstery (e-leather) and the armrests have also been redesigned to make them more comfortable. The Tejas Express boasts of an advanced smoke and fire detection and suppression system. Like the Humsafar Express, Tejas too has CCTV cameras for security and toilet occupancy indicators at each end of the coach. Digital destination boards, GPS-based passenger information display system, integrated braille displays, USB charging facility and energy efficient LED lights are some of the other prominent features of the Tejas. According to Railway Minister Suresh Prabhu, speed, comfort and safety are the focus areas of Indian Railways, with multiple projects underway to make journeys safer, more entertaining and faster. ‘Mission Raftaar’ has been announced to increase the average speed of superfast mail/express trains by 25 kmph in the next 5 years. Yet another project underway is for the retro-fitment and refurbishment of 40,000 coaches to enhance passenger amenities and comforts and add new features that boost the anti-climbing features of trains, in the case of an accident.